We are proud of our commitment to community both here in the UK and abroad. For over ten years we have been active supporters and sponsors for community development projects in both The Gambia and Uganda. Following a successful ‘Alternative Race night’ evening in May (previously reported Here) , over £8,000 was raised for projects in both these countries. 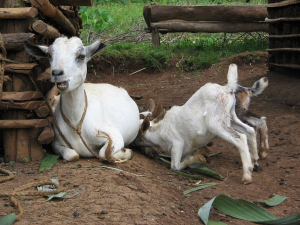 The latest project to be supported is a community goat scheme that will help 50 vulnerable families in the villages of Bufumbo and Budwale in the Mbale District of Eastern Uganda. Goats that have been crossbred to improve milk yield are being provided to improve on the nutrition of orphaned children and the families they live with. The sale of male kid goats and surplus milk from the females will also help increase household income and provide for basic needs including school fees, scholastic material, beddings and clothes, and other household needs. “The support from SQS over many years has helped the needy in our villages so much. Confidence and self-worth has been uplifted. The orphaned children who are always pushed out of family and considered as social outcasts are being accepted again in the community as they now have something to contribute to families”.